St. Elizabeth&apos;s Catholic Church is located at 207 Main Street N, Dilworth, MN. The debris was cleaned up, hauled away; the crane left, the boom lift left and two of the three dumpsters were gone. While looking at the church, it appeared there was no work taking place, but I should know better. The structural engineers were making inspections and calculations. The architect was preparing a set of blue print drawings. The rafters were ordered last week on Monday. I had meetings with the architect, mechanical and electrical engineers, interior consultants; determining what had to be replaced, what we could keep, what was damaged but yet too good to be hauled to the landfill. Yet, with all the meetings, my patience was running short wanting more to happen. Then . . . Murphy’s Law played a role and even though everything was ready for reconstruction to begin, we received 8” of new heavy, wet snow. Once again Rich, Bruce and Leonard came to my office to the rescue. We discussed all the snow coming down and they decided we had to get the snow removed from the parish center. After the snow mostly stopped on Friday afternoon, I made a few calls. Sr. Lucy, help! Dean, bring Braeden and Zoie with you, Paul, Bruce and others. All together there were nine people that shoveled snow into big, blue recycling tubs and wheeled them out the back door. It took a couple of hours however everyone was free in plenty of time to go to the KC’s fish fry. Monday morning the crane will arrive and at the same time a semi-trailer full of newly constructed truss rafters. Jay Cournia from Comstock Construction tells me that come next Friday night we will have a new roof which will be waterproof. They will have the wood sheeting nailed in place and a rubber membrane called “ice and water shield” will be laid over the total new roof. It will not be shingled yet, that will come later. Also, mid-week, Comstock will begin to cut access holes in various critical locations in the existing roof and will be re-enforcing the existing rafters over the sacristy, gathering space, office, youth room & kitchen as well as the education wing. When that is all complete, the structure will be declared safe and we can return to worship at our home. I should say, even though it appeared nothing was happening last week, many people were keeping very busy preparing for the construction beginning Monday. I would like to thank all the men that have come to help when timing was critical. On May 1, the guild sponsored “Salad Bar Luncheon” will be held at the Gathering Place at St Joe’s Church. Rather than cancel it, which would have been the easy solution, Sharon Menge and Judy Hoffman are chairing the event and they really need helpers to host this event. They need salads, ladies and men to work the dining room, kitchen, dishwasher (same as ours at St Francis) and clean-up. Please step up and volunteer to help these ladies keep the traditions of St Francis de Sales alive. Don’t let a roof collapse cause us to have an excuse! Thanks, until next week when we have a roof! The debris was totally cleaned up by the end of last week. The crane was moved out on Friday. This week, was the time for engineers and architects to go to work. Sandman submitted their calculations for the loads of the roof trusses to Comstock Construction and the replacement truss rafters were placed on order on Monday. Northland Truss will design, build and deliver them sometime the week of April 8. Comstock ordered the crane to be delivered for Monday, April 15 and they will begin setting new rafters at that time. The plywood will be placed over the trusses and the total roof covered with a “ice & water shield” membrane at that time and then the parish center will be waterproof. In the meantime, this coming Monday, April 1, Comstock will be removing the EFIS (dri-vit) from the wall on the side of the gathering space gable end. This will enable a metal flashing to be placed in the seam between the new roof and the wall it abuts to. This will be hidden by shingles and the replacement EFIS when reapplied. Sig Olson and Sons Plasterers will be the contractor repairing the EFIS coating and at the same time repairing some areas where it is cracking. They feel they can match the color well and we will not see any patches or repairs. Calculations for “beefing up” of the existing truss rafters and/or beams will be completed next week and provided to Comstock. At that time, they will cut access holes in the roof in various strategic areas and go in with the reinforcing lumber to make repairs to the existing truss rafters. The shingles that are on the roof are ten years old so we purchased a bundle of new shingles from the same manufacturer and color and laid them on the roof as a test. The existing shingles have faded so much the new shingles looked like they didn’t belong. I decided we would totally re-roof the total church building after repairs are made so it does not look like a patch job at completion. Our insurance company has agreed and will cover the cost of a new roof. With all the input from engineers and architects, the building permit was applied for with the City building codes office and we should have it on Monday so re-construction can officially begin. JUST MY THOUGHTS--We have been truly blessed throughout this whole ordeal. Even though we lost a roof and the use of the south side of our building, the Boy Scouts and the Parishioners are all safe; NO injuries. The Moorhead Firefighters were able to react; shut off the natural gas and sealed the gathering space from the weather. Trades people from St Francis de Sales were able to shut off gas and eliminate damaged gas lines, maintain heat in the church, restore water service, isolate damaged electrical systems and reconnect key circuits for temporary heat and light. The Wednesday maintenance crew has been working overtime to secure the building, Comstock Construction was able to act immediately to become our general contractor and clean up the mess, Sandman Engineers were able to work us into an already full schedule, Foss Architects will be producing drawings next week and reconstruction will begin within three weeks of the devastation. On top of all these blessings, a call to the Hispanic community and they began shoveling snow off the roof; Brent Dietrich brought his boom lift to hoist them onto the roof; Jason Lee driving by and noticing the roof collapse and then bringing his company’s heavy equipment to clean our parking lot so everyone could gain access. Vern & Bruce Senger began blowing snow to assist in the melt. This was all happening on Sunday, March 10. Then the offers of assistance which came from the Mormon Church of Fargo, Our Saviors Lutheran, our neighbors, offering their facilities and help, St Elizabeth’s accommodating our mass schedule and providing meeting rooms, Karen Thom putting up with the hectic schedule she is now faced with at St Elizabeth’s plus having surgery this week and Deacon Tom Cerar for making us feel so “welcome.” Then came St Joseph’s; providing office space for Dennis or as it is affectionately called “St Francis South”; Andrew Hilliker opening the school for our religious education classes on Wednesday night, allowing the Salad Bar Luncheon to take place on May 1 as scheduled in their gathering place, opening their schedule for a wedding, making the gathering space available to the KC’s for the Lenten fish fries and to top it all off; our Fall Festival will be held the first weekend of October as always . . . but at St Joseph’s Church. The Parishioners of St Francis de Sales are able celebrate Eucharist and worship together as family at mostly the same times only temporarily in a different location. Most of all, if we could all keep Fr. Raul in our prayers. He has been asked to do things this last month that they do not prepare you for in the seminary. He is Dean of our deanery, he is acting as priest for four parishes right now and soon to be Holy Week; the busiest time of the Church Year. If at times he seems to be pre-occupied, he probably is. At times, we may feel inconvenienced but we must surely be thankful for all the blessings that God has bestowed on us. Our family is truly one with God! ‘Til next week . . .
We have now completed clean-up of the debris fallen into the Parish Center. Comstock has hung vinyl over all openings so in case of rain or more snow, things can stay dry. We are now ready for reconstruction to start. We have retained the services of Foss Architects to create the plans for reconstruction. They will sub out the electrical and mechanical engineering services. Sandman Engineers will continue as our structural engineer and Comstock will continue as the prime contractor and they will sub out the HVAC and electrical construction services. There are four areas of concern in the remaining structure that will have to be addressed before we can occupy our church building. They are the roof over the working sacristy located behind the altar, office trusses, trusses over the gathering space and trusses over the north half of the education wing. It appears we will have to re-enforce those rafters but when finished and signed off, the codes officials will allow us to begin using all the existing structure. I will not have a more definitive timeline until after meetings taking place next week. The new truss rafters will be ordered next week Monday and will be on site in 10 days to two weeks. Next week, the insurance claims people will be in town to view our progress. At that time, we will find out the extent of our coverage, the approval of the fix of re-enforcement of existing truss rafters, negotiate the contract for reconstruction with Comstock Construction, Inc. and our direction going forward. At that time, I will be able to create a timeline for completion of all tasks required, bid documents and contractors. Everything stayed on time this week and went very smooth. Casualties as you see in the video: Jesus got injured! You can see he got his nose broken on the crucifix. It can be repaired! The statuary also got injured, Jesus has a broken hand, St Francis has a broken arm and vestments. They can be repaired. We lost the piano, speakers, base stand for Jesus, and frame for the Last Supper picture. Our lady of Guadalupe picture survived unscathed. The clock stopped at 9:43AM. Flooring, folding doors, ceiling, lighting and all things electrical, sheetrock, chairs and tables were lost. We were able to recover about 135 chairs and about a dozen round tables. Next week we will inspect those salvaged to make sure they are in good shape. In summary, everything is proceeding smoothly and on schedule. The office staff continues to function , Fr Raul, Deacon Dean and Sr. Lucy continue with their various work in ministry to the Parishioners. Bonnie, Lisa, Dennis and Anthony are working remotely but sneaking back into the office from time to time. I will have another post after the events next week to bring you all up to date once again. Have a blessed week. The Easter Vigil time has changed from 9 pm to 8:30 pm on Holy Saturday, April 20. A reminder that there is no 5 pm Saturday March 23 Mass at St. Elizabeth&apos;s: please attend Mass at St. Joseph instead. The Retreat "A Blessed Marriage: the Message of the Beatitudes" will be held at St. Joseph&apos;s. If you have not already signed up, the form is in this weekend&apos;s bulletin. Stations of the Cross on Friday this week (3/22) will be held at St. Elizabeth&apos;s in English instead of Spanish. 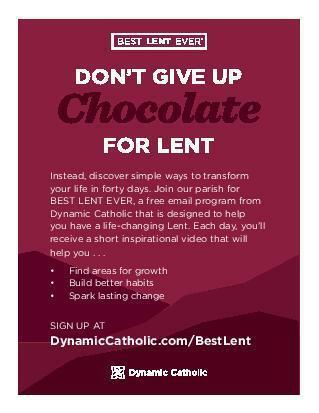 Come and join our community for this beautiful Lenten devotion. In addition there will be a Holy Hour at St. Elizabeth&apos;s at 6 pm Thursday starting this week. Daily Mass for the St. Francis community will be held at St. Elizabeth&apos;s, Monday through Thursday, at 9 am. Msgr. Krebs will celebrate on Wednesday and Fr. Raul the other days. A question has come up about St. Francis&apos; Masses being held at St. Elizabeth&apos;s. The 5 pm Saturday, 10:30 am Sunday, and 12 noon Sunday Masses are not regular St. Elizabeth&apos;s Masses. They will be presided by Fr. Raul and are for St. Francis parishioners (though, as always, anyone is welcome to attend). In addition, after the Masses this weekend Swede Stelzer will speak to give an update on the progress of rebuilding our church. Please come and show your support for St. Francis Parish as you worship our Lord. Starting today the Hispanic community will hold Stations of the Cross Fridays at 6 pm at St. Elizabeth&apos;s. Stations in English are available at St. Elizabeth&apos;s at 6:30 pm on Wednesday, March 27, and on April 3, 10, and 17. English Stations are also held at St. Joseph&apos;s on Wednesdays at 6:45 pm. ***Correction*** Morris Cossette&apos;s funeral will be Saturday the 23rd at St. Joseph&apos;s at 11 am, not 10 am as originally posted. As we clean up and begin to rebuild, we expect that all ordinarily scheduled events will take place (exception: see below). Please contact the event leaders or watch this space for the locations of the events. Going forward activities will only be cancelled due to weather, according to our weather policy. The Salad Bar Luncheon will be held as scheduled on May 1 but at St. Joseph&apos;s in the Gathering Place. There is a wedding scheduled at St. Elizabeth&apos;s on Saturday the 23rd. Saturday evening Mass on that day is cancelled and we ask all Saturday folks to go to St. Joseph&apos;s at 5 pm with Confessions at 4 pm. (from Swede Stelzer, Parish Management Coordinator) Comstock Construction has the exposed ends of the building sheeted and covered to keep the weather out of the undamaged part of the building. I have obtained the proxies necessary from the Bishop for Fr. Raul to enter into contracts with others to clean up the mess and reconstruct what was damaged. The salad bar luncheon will continue to be held only the location is changed to occur in the St Joes Gathering space. We have their space for set-up on April 30 and the luncheon on May 1. Sharon Menge is the chair and she is meeting with several ladies today to coordinate the event. We have been in discussions with attorneys, engineers, chancery, contractors, volunteer maintenance and insurance claims supervisors as well as phone calls to office concerning the rebuilding. Comstock placed plywood sheeting on the exposed walls of the gathering space and the kitchen and upper room on the south. Comstock will be bringing a crane on site and will pick the debris out of the parish center from on top. The two sets of double doors from the gathering space have been secured with water dams to keep the rain out of the gathering space and the same with the kitchen and education wing. There are eight heat ducts around the perimeter of the parish center that have been converted to act as drains for melting snow and rain. Two of the furnaces in the mechanical room have been pulled and the ductwork under the floor will gather the water to the pedestal the furnaces sat on. We have placed a trash pump in that collection bonnet and will pump rain or snow water from the ducts to the sewer. These actions will assure the gathering space remains undamaged. Let us praise and thank Our Lord that no one was injured. Watch this space for more information as it becomes available. or FirstChoice Clinic (701) 237-6536. The Rosary is very nearly a perfect form of Christian prayer, being a devotion both to Our Blessed Mother and to her son, Jesus. It takes only about 15-20 minutes a day to say one set of mysteries, and the benefits are tremendous: stronger families, peace of heart, spiritual understanding. This is a prayer to implore God&apos;s mercy upon the world, in reparation for the sins of humanity. Jesus gave it to St. Faustina, a Polish nun who lived during the 1930&apos;s, as a way for people to do penance for their sins and those of others. It is prayed on standard Rosary beads and many people pray it right after praying the Rosary. (On each “Our Father” bead of the rosary, pray) Eternal Father, I offer you the Body and Blood, Soul and Divinity of Your Dearly Beloved Son, Our Lord, Jesus Christ, in atonement for our sins and those of the whole world. (On each of the 10 “Hail Mary” beads, pray) For the sake of His sorrowful Passion, have mercy on us and on the whole world. (Repeat 3 times) Holy God, Holy Mighty One, Holy Immortal One, have mercy on us and on the whole world.